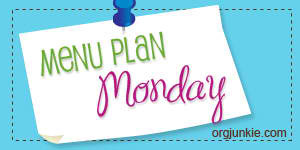 Please join us for Menu Plan Monday at I'm an Organizing Junkie. Everybody seems to be on the mend after last week's battle with illness. It was a long week where nothing was accomplished, so I am hoping for a much better week this week. This week I am going to be doing something a little different and planning out all of my meals, I am hoping that this will make my life just a little bit easier.